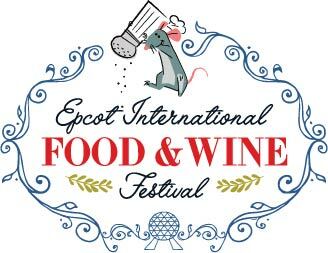 It’s that time of year again as I head back to the 2017 EPCOT Food & Wine Festival and try all the different dishes as we take our “trip around the world”. 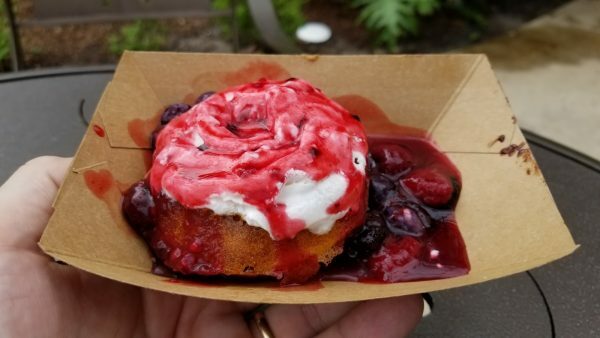 Disney does a fantastic job in keeping with the authenticity of the dishes, yet making them palatable for the majority of the public that are not that adventurous of eaters. A lot of the same options that I reviewed last year were back again, but I tried to work in some new ones too. I always try my top 3 from last year to see if they were as good, if not better. 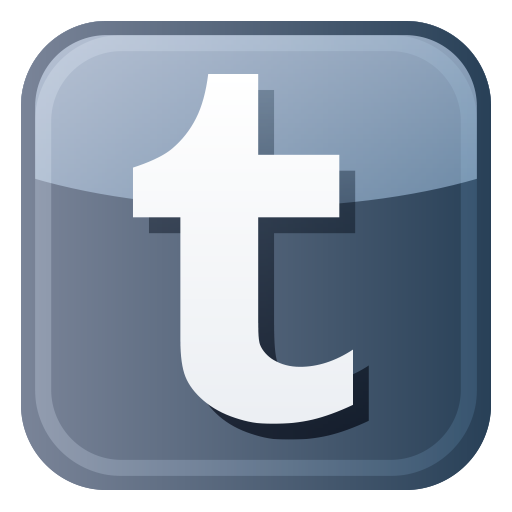 Below I will not feature everything I ate, just my “Top ATE” dishes from 2017, so let’s jump right in and see what I had to eat! #8 – Belgium – Belgian Waffle with Berry Compote – ($4.00) – Moving down my list from #4 to #8 is this dessert. They prepared it differently this year and added way too much berry compote. The waffle ended up being a little bit soggy and the whipped cream was not that appealing with the sauce over the top. We did detect a hint of wine in the berry compote which we did not last year, so they must be playing with the recipe a bit. This is still a favorite and it had to make the list even though the execution was not as good as previous years, but we hope they fix the presentation issue, then it would be perfect. 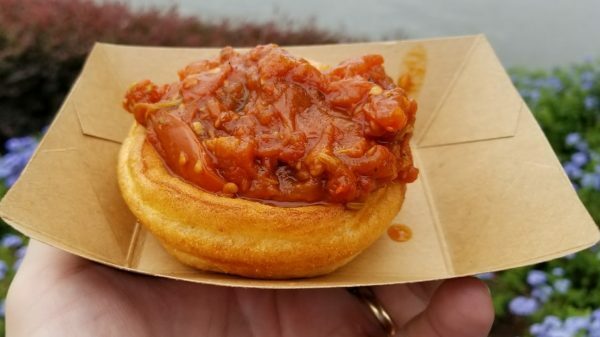 ***UPDATE*** – I have seen another photo of this dish from others attending the event on social media, and it was not assembled this way, so I guess it depends on who is making it. #7 – The Cheese Studio – Braised Beef “Stroganoff” with Tiny Egg Noodles, Wild Mushroom, and Boursin Garlic and Fine Herbs Cheese Sauce – ($5.00) – Next up at number seven is a new dish that I was looking forward to trying the most. While the beef was fork tender and had good flavor, the cheese sauce that should have been the star of the dish, was lacking flavor and quantity. The egg noodles were more like a spätzle than a noodle and were a little bit chewy. I was a little bit disappointed with this dish, but it was still good enough to make the list. 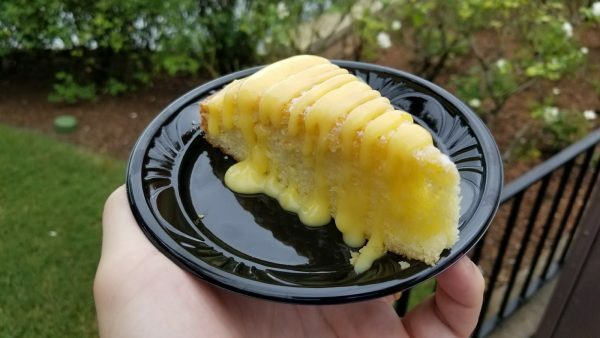 #6 – Spain – Sweet Olive Oil Cake with Powdered Sugar and Lemon Curd – ($3.75) – The first dessert to make my list is this wonderful olive oil cake! The cake was slightly chilled and had a texture like corn bread. The lemon curd sauce was drizzled over the top just before service and was wonderful! It had just enough zing to “tweak the cheeks” as I like to say. Portion size for the price paid was also very generous. 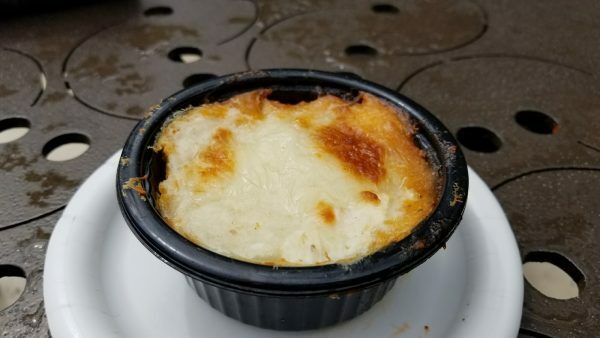 #5 – Brazil – Escondidinho de Carne “Little Hidden One” – ($5.00) – Moving down three spots from #2 to #5 this year is this “South American Shepard’s pie”. Execution of the dish was the same as last year, but it seems like there was a flavor element that was different or missing. 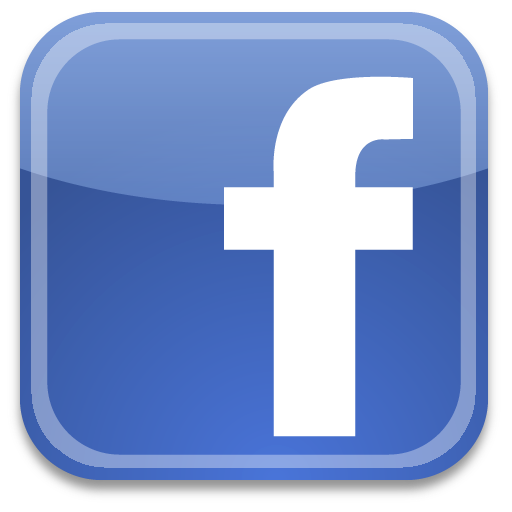 It did not seem to have the same richness that it did last year. The Yucca on top was very smooth, creamy, and slightly crusty around the edges which gives it an additional texture element that I am a fan of. 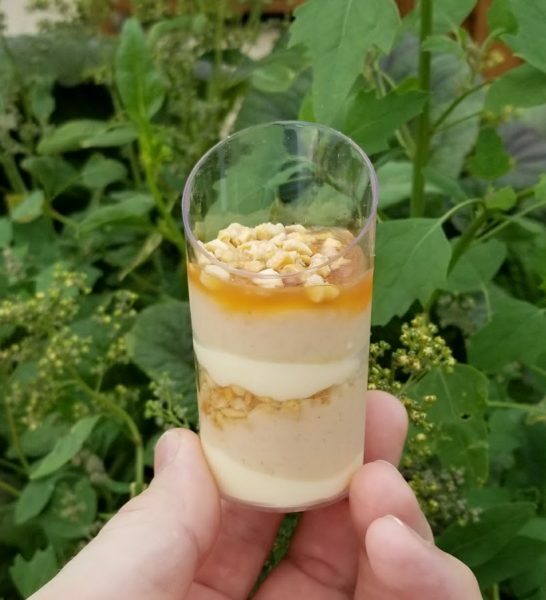 #4 – Earth Eats – Peanut Butter and White Chocolate Mousse with Caramel Drizzle – ($3.50) – Anything dessert with peanut butter in it always gets my attention, and this one did not disappoint! While probably one of the smallest portions at the festival, it was packed with BIG flavor! Layers of white chocolate mousse, peanut butter mousse, caramel drizzle and candied peanuts are repeated in this small container. I think I got maybe four bites out of it, but they were so good! 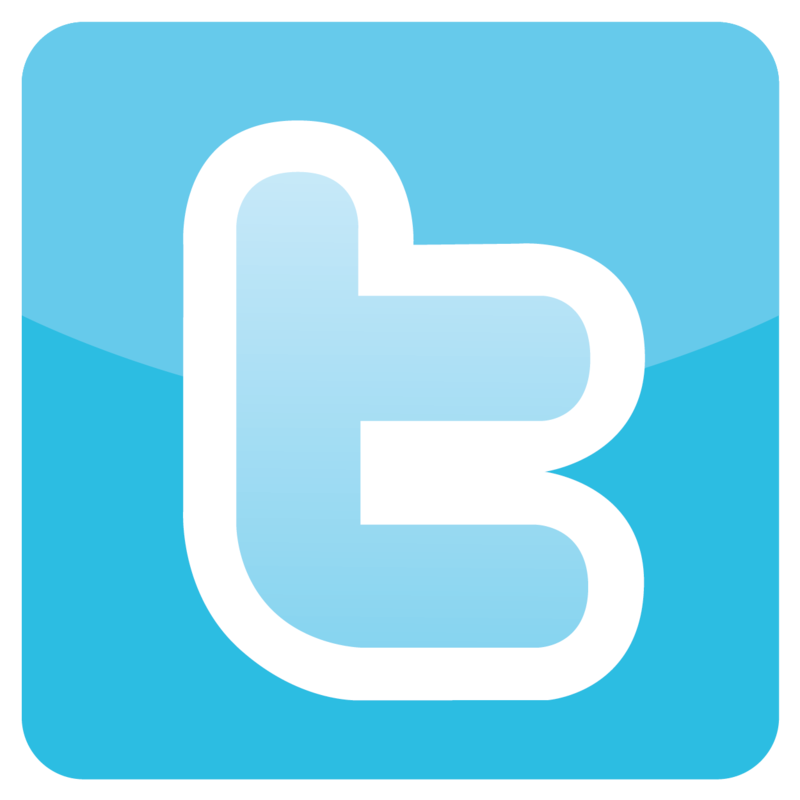 I highly recommend this one, but make sure you get a few of them, because it will disappear before you know it! #3 – New Zealand – Lamb Meatball – ($5.25) – This dish also came in at my #3 pick for last year and it was good enough to keep its position on my list again. This time I saw them make it and put the golf ball size meatball in the bread bowl before putting the chutney over the top. It’s a decent portion for the price and very filling. The lamb meatball does not have any gamey flavor, so don’t let that stop you from trying it even if you’re not that fond of lamb. The bread bowl held up well when I picked it up to take a bite. The tomato chutney was fresh, sweet, with a slight bit of heat. It was delicious! 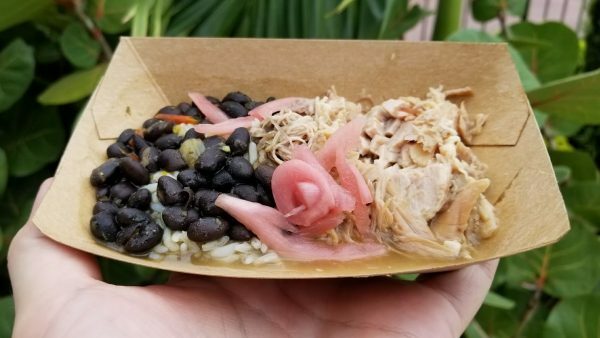 #2 – Islands of the Caribbean – Mojo Pork with Black Beans and Cilantro Rice – ($5.00) – A new dish at the festival has made its way to the top of my list! 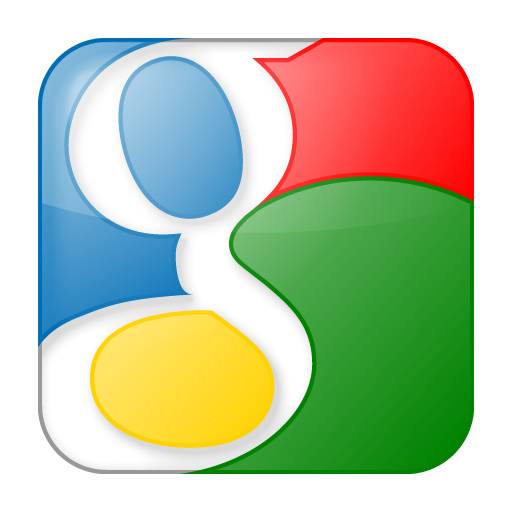 It looks quite bland, but it’s anything but. The pork was very tender and had lots of juice with it to keep it moist. 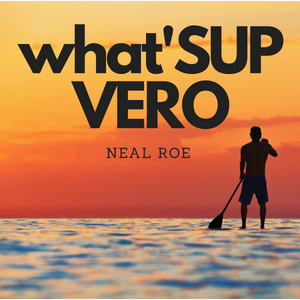 The mojo flavor was just enough to let you know it was there, but not overpowering. But the star of the plate was the rice and beans! They had TONS of flavor and I seriously could have gone back just for them, they were that good! 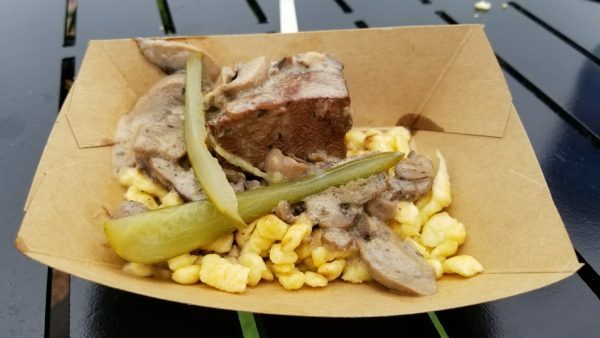 And finally, the #1 dish from this year’s EPCOT Food & Wine Festival 2017 is. 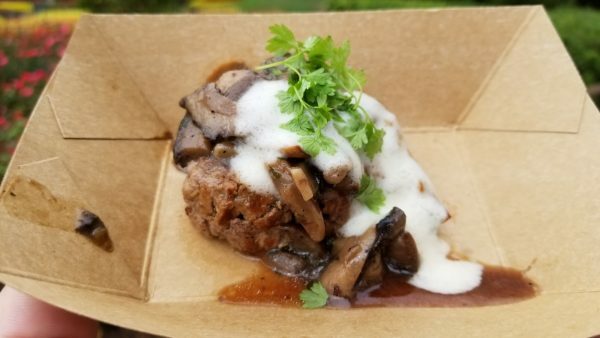 . .
#1 – Canada – “Le Cellier” Wild Mushroom Beef Filet Mignon – ($8.00) – Congratulations once again to the Canada booth for taking the #1 spot two years in a row on my “Top ATE” list! The filet was cooked to a perfect medium and cut so easy with a plastic knife, you would think you were cutting through warm butter. Its served with sautéed mushrooms in a truffle-butter sauce that was outstanding! How much did all of this fun cost us you ask? We were surprised when we got home and totaled up all our receipts. 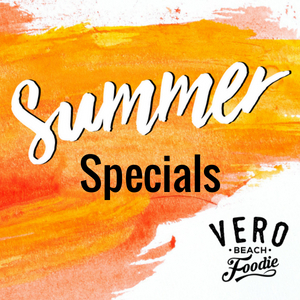 For everything that you saw in this post plus a few more dishes that were not featured, two people sharing each dish, our total was only $68.50! Last year’s total was $63.25, so we ended up spending $5.25 more this year. I did notice a slight increase in price on some of the items, so that accounts for the higher amount, and we may have had 1 more dish than last year too. Our total for the day, with a tank of gas and parking included on my wife’s annual pass was just a little over $98.50! I originally was not planning on going again this year, since the dishes had not changed that drastically from last year, but Disney contacted me and offered two press passes to get into the park so I could write about it again. If they offer them again next year, then I’ll just have to take them up on their offer and eat my way around the world again!